Qualcomm Snapdragon 712 announced with Quick Charge 4+ technology. 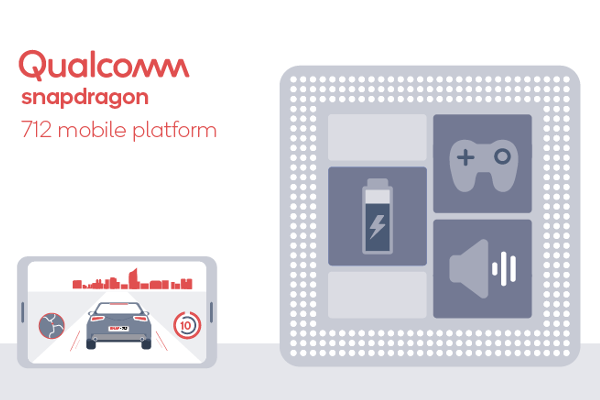 Qualcomm today announced Snapdragon 712 Mobile Platform, packing all the AI smarts and premium features of its predecessor, the Snapdragon 710 Mobile Platform, and adds performance boosts that make it a powerhouse for gaming and beyond. Like the Snapdragon 710, this next-generation mobile platform is built on a 10-nm process and the sophisticated, multicore Qualcomm AI Engine, consisting of the Qualcomm Kryo 360 CPU, Qualcomm Adreno 616 GPU, and the Qualcomm Hexagon 685 DSP. Snapdragon 712 provides up to a 10 percent increase in performance over Snapdragon 710. The Adreno 616 GPU is specifically designed to allow you to enjoy console-like gaming and cinematic movie experiences on your smartphone, rendering over one billion shades of colors. And the Qualcomm Aqstic audio technology delivers incredible sound quality, making the gaming experience even more immersive. The platform integrates the Snapdragon X15 LTE Modem, which lets you connect quickly and enjoy lightning-fast speeds. Designed to tap into several enhanced 4G LTE features and with support for 4x4 MIMO and License-Assisted Access (LAA). Smart, fast AI is one of the biggest perks of the Snapdragon 712. The same multicore engine that's boosting gaming is also responsible for running other cutting-edge applications and features, such as camera and voice. Take camera, for example: the Qualcomm AI Engine knows your setting preferences and automatically adjusts to them, and it can also detect if you're shooting in low light and then raise the foreground lighting to help you take the best shot possible. The Snapdragon 712 is engineered to optimize your battery life, saving it in the short and long term. The platform's heterogeneous computing structure helps balance your application's workloads, maintain low thermals, and optimize for power and performance so your applications can run fast continually. It also supports Qualcomm Quick Charge 4+ technology, which can bring your battery from 0 to 50 percent in just 15 minutes.